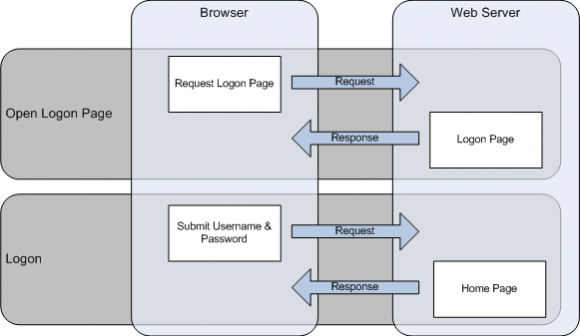 One of the most commonly misscripted elements in performance testing is web authentication. 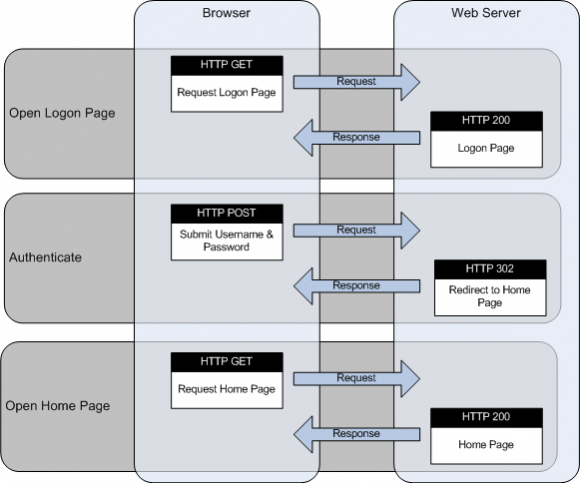 I’m not talking about integrated authentication like SPNEGO, I’m talking about a simple HTTP POST with authentication details followed by the sites authenticated home page. The problem is that the user experiences a two step process. In reality the process is actually 3 steps, with the middle step is transparent to the user. Because it is transparent, tools like LoadRunner will attempt to represent the end-user experience and record only two steps. In most cases, this is the desired end-result. The following diagram shows the three steps that occur. The issue with recording Logon like this, is that it does not allow you to separate the authentication time from the loading time of the subsequent page. Its a simple process to separate the timing of the authentication and the subsequent page load, and the following code snippet shows you how to do it in LoadRunner. I recently came across a problem with trying to record a login to a website. After posting my login credentials, I received a 302 redirect that contained several Authentication cookies. Unfortunately, LoadRunner was not recognising the cookies and the subsequent page redirected me back to the login page. As login was obviously working in the browser, I recorded a clean session using the fabulous Firebug. Now that I was able to directly compare the HTTP headers. It quickly became evident that the reason was that LoadRunner wasn’t reading the entire 302 Header. Time to pull out Firebug.